Max. Service Temperature up to 215°C (420°F). Flat, leaf-type thermocouple ideal for measuring layers of plywood, plastic, paper and various laminates, with long, 50 cm length. The thermocouple is ≈0.3 mm thick and protected by a ≈0.6 mm thick PFA sleeve, with 50 mm bare at the measurement end. Max. service temperature is 215°C. The 88304 is supplied with an OMEGA™ OST standard-size connector with a TAS-2 standardto- mini adaptor, and TEC extension cable. Short leaf-type thermocouple ideal for measuring layers of plywood, plastic, paper and various laminates. The thermocouple is 25 mm long by ≈7.5 mm wide and ≈0.3 mm thick, protected at it's base by a 6 mm long by ≈0.6 mm thick PFA sleeve. Max. service temperature is 215°C. The 88303 is supplied with an OMEGA™ OST standard-size connector with a TAS-2 standard-to-mini adaptor, and TEC extension cable. Fast response flat leaf-type thermocouple ideal for measuring layers of plywood, plastic, paper and various laminates. The thermocouple is 100 mm long and 0.05 mm thick. Max. service temperature is 210°C . The 88309 is supplied with an OMEGA™ TAS-3 adaptor and TEC extension cable. Magnetized probes, suitable for long term contact pressure. Requires 10 minutes to reach full surface temperature. The 88401 is rated to max. surface temperature of 250°C. The 88402 is rated to max. service temperature of 400°C. 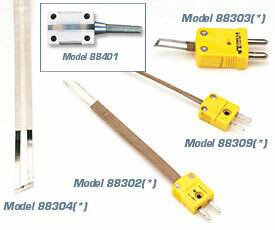 Flat leaf-type thermocouple ideal for measuring layers of plywood, plastic, paper and various laminates. The small transition allows the probe to be permanently mounted in many installations. Max. surface temperature is 210°C. The 88302 is supplied with an OMEGA™ TAS-3 adaptor and TEC extension cable. Nota: Due to the design and construction of the 88302/88303/88304/88309/88402, the element is not replaceable.